This example shows how to solve portfolio optimization problems using the problem-based approach. For the solver-based approach, see Quadratic Programming for Portfolio Optimization Problems, Solver-Based. Suppose that a portfolio contains different assets. 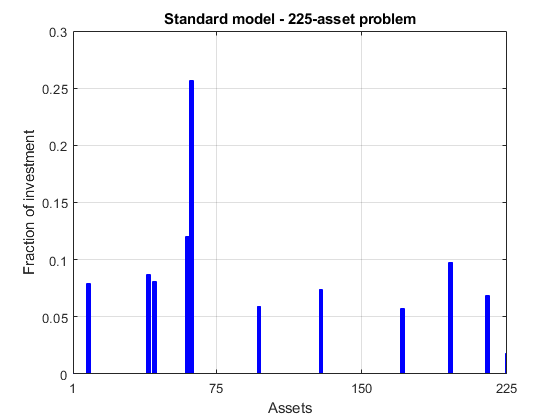 The rate of return of asset is a random variable with expected value . The problem is to find what fraction to invest in each asset in order to minimize risk, subject to a specified minimum expected rate of return. Let denote the covariance matrix of rates of asset returns. subject to a set of constraints. Since the objective to minimize portfolio risk is quadratic, and the constraints are linear, the resulting optimization problem is a quadratic program, or QP. Let us now solve the QP with 225 assets. The dataset is from the OR-Library [Chang, T.-J., Meade, N., Beasley, J.E. and Sharaiha, Y.M., "Heuristics for cardinality constrained portfolio optimisation" Computers & Operations Research 27 (2000) 1271-1302]. We load the dataset and then set up the constraints for the problem-based approach. In this dataset the rates of return range between -0.008489 and 0.003971; we pick a desired return in between, e.g., 0.002 (0.2 percent). Load dataset stored in a MAT-file. Calculate the covariance matrix from correlation matrix. Create an optimization problem for minimization. Create an optimization vector variable 'x' with nAssets elements. This variable represents the fraction of wealth invested in each asset, so should lie between 0 and 1. The objective function is 1/2*x'*Covariance*x. Include this objective into the problem. The sum of the variables is 1, meaning the entire portfolio is invested. Express this as a constraint and place it in the problem. The average return must be greater than r. Express this as a constraint and place it in the problem. Set some options, and call the solver. Set options to turn on iterative display, and set a tighter optimality termination tolerance. Call solver and measure wall-clock time. Elapsed time is 0.292806 seconds. Add group constraints to existing equalities. Elapsed time is 0.162406 seconds. Plot results, superimposed on results from previous problem. 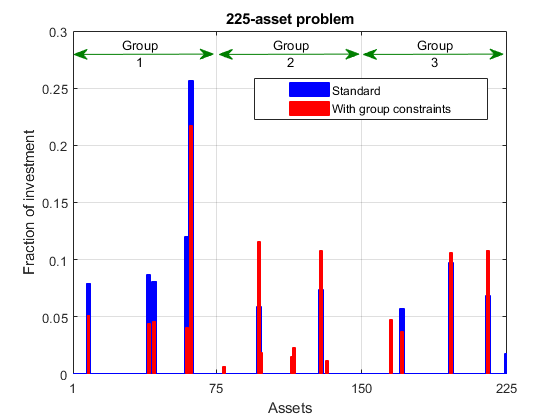 We see from the second bar plot that, as a result of the additional group constraints, the portfolio is now more evenly distributed across the three asset groups than the first portfolio. This imposed diversification also resulted in a slight increase in the risk, as measured by the objective function (see column labeled "f(x)" for the last iteration in the iterative display for both runs). In order to show how the solver behaves on a larger problem, we'll use a 1000-asset randomly generated dataset. We generate a random correlation matrix (symmetric, positive-semidefinite, with ones on the diagonal) using the gallery function in MATLAB®. Reset random stream for reproducibility. Generate means of returns between -0.1 and 0.4. Generate standard deviations of returns between 0.08 and 0.6. Create the optimization vector variable 'x' with nAssets elements. Include the objective function into the problem. Include the constraints that the sum of the variables is 1 and the average return is greater than r.
Elapsed time is 0.913357 seconds. This example illustrates how to use problem-based approach on a portfolio optimization problem, and shows the algorithm running times on quadratic problems of different sizes. More elaborate analyses are possible by using features specifically designed for portfolio optimization in Financial Toolbox™.